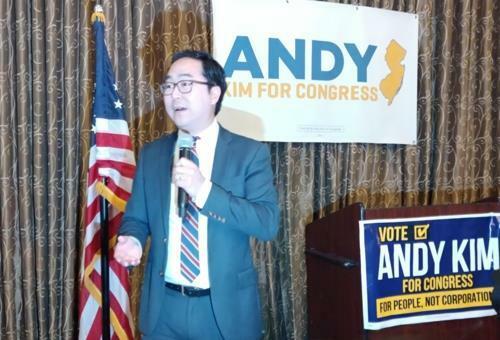 WASHINGTON, Nov. 14 (Yonhap) — Korean-American Democrat Andy Kim has been elected to the U.S. House of Representatives, local media reported Wednesday, becoming the first Korean to serve in Congress in 20 years. The result comes eight days after the U.S. midterm elections Nov. 6. Kim and MacArthur were in a tight race, with the Democrat initially trailing. But the final outcome reflects absentee votes and ballots cast at six polling stations in areas that were seen as favoring Kim. A graduate of the University of Chicago, Kim worked as director for Iraq issues on the Obama administration’s National Security Council, and enjoyed the former president’s strong backing. The only other Korean-American to serve in Congress was Jay Kim, a Republican who represented California’s 41st district from 1993 to 1999. In California’s 39th district, the jury is still out on Republican Young Kim, who, if elected, will become the first Korean-American woman to serve in Congress.